From Siddharth to Sakyamuni and finally to the Buddha or the Enlightened one - an incredible transformation of prince to an enlightened teacher , who walked the earth more than 2500 years ago. This tour will take you to the most important places to give you insight into the 800 years old Buddhist religion as well as the world's best monuments of great history and art. You will start the tour with visit to the World's greatest monument of Love -Taj Mahal, now a wonder of the World, The Nirvana city -Varanasi which still have traditions and cultural values intact just like it used to be centuries ago. Bodhgaya - the Mahabohi Temple where Lord Buddha got the enlightenment and continue traveling on his footsteps visiting Mumbai, Aurangabad,Agra,Varanasi,Bodhgaya, Patna and traveling back to Capital city Delhi. Day 01 - Mumbai Mumbai. Upon arrival, you will be received by our representative & transferred to the hotel. Check in & overnight at the hotel. After breakfast transfer to the airport to take the flight to Aurangabad. Upon arrival, you will be received by our representative & transferred to the hotel. Afternoon visit to Ellora Caves - In Ellora, there are 34 cave temples and out of these 12 are Mahayana Buddhist caves, 17 are Hindu caves and 5 are caves of the Jain faith. Overnight at hotel. After breakfast proceed for full day trip to Ajanta Caves- The first Buddhist cave monuments at Ajanta date from the 2nd and 1st centuries B.C. During the Gupta period (5th and 6th centuries A.D.), many more richly decorated caves were added to the original group. The paintings and sculptures of Ajanta, considered masterpieces of Buddhist religious art, have had a considerable artistic influence. . Later transfer to Jalgaon railway station to connect train for Bhopal. Overnight in train. On arrival, you will be received by our representative & transferred to the hotel. After some rest, you will be taken for the visit to Sanchi - for view the great STUPA. Sanchi Stupa" is a famous ancient Buddhist monument. The Stupa is a wonderful testament to the artistic prowess of Buddhist monks. Emperor Asoka (273-236 B.C.) built stupas in Buddha's honour at many places in India. The stupas at Sanchi are the most magnificent structures of ancient India. Stupas are large hemispherical domes, containing a central chamber, in which the relics of the Buddha were placed. The stupas at Sanchi traced the development of the Buddhist architecture and sculpture at the same location beginning from the 3rd century B.C. to the 12th century A.D.. Overnight at hotel. Transfer to the station to take the train to Agra - upon arrival in Agra, you will be received & transferred to the hotel. Check in & take some rest. And then visit TAJ MAHAL. Taj Mahal is regarded as one of the eight wonders of the world, and some Western historians have noted that its architectural beauty has never been surpassed. The Taj is the most beautiful monument built by the Mughals, the Muslim rulers of India. Taj Mahal is built entirely of white marble. Its stunning architectural beauty is beyond adequate description, particularly at dawn and sunset. The Taj seems to glow in the light of the full moon. On a foggy morning, the visitors experience the Taj as if suspended when viewed from across the Jamuna river. Overnight at the hotel. Morning sightseeing of the city covering Red Fort-The construction of the imposing Agra fort/Red Fort, built of blocks of red sandstone, began in 1156 during the reign of the great Mughal Emperor Akbar. The fort was completed in 1605 during the reign of his grandson Shah Jahan in 1605. Built in the Indo-Saracenic style of architecture, which was the hallmark of the Mughal period, this sprawling fort stretches 2.5 km along the banks of the Yamuna River in Agra, in the north Indian state of Uttar Pradesh, Itmud-ud-duala Tomb. Later transfer to railway station to connect overnight train to Varanasi. Overnight at train. On arrival transfer to the Hotel for check in. Proceed for half day sightseeing of Sarnath- A famous archaeological sight in Uttar Pradesh, Sarnath is an important Buddhist sight. Lying at a distance of about 10 kms from the holy city of Varanasi, Sarnath is one of the four important geographical landmarks in the life of Buddha. After attaining enlightenment at Bodhgaya, Buddha left for Sarnath where he first preached. Followers of Buddhism from all over the world look upon India as the land of their sacred lord and home to some of the blessed Buddhist destinations. If Buddhism appeals to you and you would like to brush shoulders with this unique facet of religion, then book yourself with Tour Packages for Sarnath. Overnight at hotel. Early morning boat ride on river Ganges. Breakfast at hotel. Later leave for Bodhgaya. Overnight at hotel. Visit to Mahabodhi Temple-The Bodhgaya Stupa, or Mahabodhi Vihara as it is also known, was erected in the place where Buddha Shakyamuni gained enlightenment some two thousand five hundred years ago. Its origins are lost in time, but it is known that King Ashoka erected a shrine to Buddha here in the third century B.C. In spite of extensive research by scholars, until this day no one has been able to give a definite date as to when this present temple was built, who constructed it or how long it took to be completed. It is generally believed that the Great Stupa must have come into existence between the fifth and seventh centuries A.D and Niranjana river. Overnight at hotel. Leave for Patna enroute visiting Rajgir- Rajgir is 12 kms south of Nalanda on the road to Bodhgaya and is located in a verdant valley surrounded by rocky hills. It is sacred to the memory of founders of both Buddhism and Jainism. Lord Buddha spent many months of retreat during the rainy season here and used to meditate and preach on the Griddhankuta, the hill of the Vultures. An aerial ropeway provides the link with a hilltop stupa built by the Japanese. 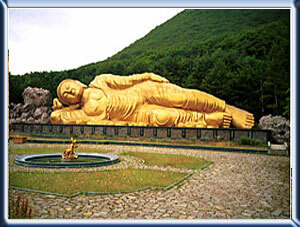 One of the hills is the cave of Saptparni, where the first Buddhist Council was held. The Saptparni cave is also the source of the Rajgir hot water springs that have curative properties and are sacred to Hindus and Nalanda-today in ruins; is the famous site as an ancient seat of learning of yester years. Founded in the 5th Century AD, this great seat of learning flourished until the 12th Century. Both the founders of the two religions Buddhism and Jainism, the Buddha and Parsvanath Mahavir, visited Nalanda. The Chinese chronicler Huien Tsang spent many years here both as a student and as a teacher Overnight at hotel.